PMView Pro 3.40 is viewers software developed by Nielsen Software Enterprises, Inc. Image viewer, editor, and convertor. PMView Pro features support for over 40 file formats, automatic thumbnailing, thumbnail image browsing, screen capture utility, TWAIN interface for scanners, image filtering and more. In addition PMView is faster, smaller, and lighter on system resources than other leading image viewers. 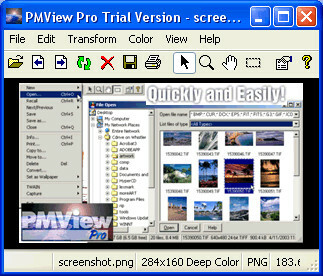 This program is shareware, which means you can download and use PMView Pro 3.40 for free during 30-days trial period. After this period you gonna have to buy PMView Pro 3.40 software for $49.95 or uninstall the program. PMView Pro 3.40 supports different languages (including English, German, Russian, French). It works with Windows 98/XP/Vista. We have tested PMView Pro 3.40 for spyware and adware modules. The software is absolutely safe to install. We has completely tested viewers software PMView Pro 3.40 many times, written and published the interesting article and uploaded installation file (2037K) to our fast server. Downloading PMView Pro 3.40 will take minute if you use fast ADSL connection.